Introduced around the 1930s, chest freezers have become a great way to store your frozen goods without taking up a lot of room in your refrigerator. Chest freezers can be stored in locations like your kitchen or other accessible spots in the home, like the garage. These appliances are also great for places like apartments and townhomes depending on their size. As with most major appliance purchases, it can be very confusing for the buyer to know what to purchase. One chest freezer option is the GE chest freezer. In order to help clear the confusion, we've created a list of some great options like the GE chest freezer. This GE chest freezer has interior lighting so you can see inside when you need to. This chest freezer is 10.6 cubic feet in size, which is a lot of storage. Handles on this product are recessed on the freezer lid. When it's time to defrost this GE chest freezer, there is a usable manual mode to begin the process and a drain on the front to let the excess liquid to flow out. Inside this freezer are three separate baskets that can lift out to make more room if the need arises. This gives the buyer plenty of organization and keeps their small items from getting all mixed up. Beneath the three wire baskets is a wide open space to place your bigger items that you'd like frozen. It also comes with an adjustable thermostat, so you keep your food at the right temperature. 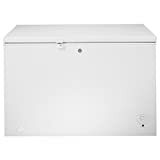 Dimensions for the GE chest freezer are 50.8” x 27.5” x 33.5” This is a streamlined design that is protected with a lock and key on the front of the freezer. A turn-style knob at the bottom right of the freezer showcases the temperate control the freezer comes with. When frost builds inside your GE chest freezer use the manual defrost feature and open the drain to the water out. This product weighs 115 pounds and comes in white. This GE chest freezer will cost you around $$ before adding on costs like sales tax, shipping, and even product protection fees. Retailers that offer this brand of freezers are Lowe's, Home Depot, Best Buy and Amazon. Some other merchants that advertise this chest freezer are JCPenny, Sears, Sam's Club, and from GE directly via their website. GE also has authorized retailers, some of which were previously listed. We picked a few similar products available on the market to see how they compare. We based these products on a few different factors like how long they last, their overall cubic size and storage style. 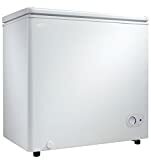 We've added three other chest freezers we find comparable to the GE chest freezer. A GE chest freezer will cost you a bit more money than a cheaper model that isn't very big. The cheaper models also won't have a manual defrost or a drainage pipe if you ever needed to defrost it by turning it off. This chest freezer will cost you about $$ before your local sales tax and other fees like shipping. Features on this GE chest freezer include manual defrost, and it comes complete with a water drainage hole. The temperature is controlled to help keep your items as cold as you need. An indicator light on this chest freezer lets the user know that the freezer is plugged in and on. It also comes with interior lighting so you can see what you're doing every time you reach in and out of the freezer. When you do reach inside, you'll find three storage baskets you can lift out to clean or make space in the freezer. The overall capacity of the freezer is 10.8 cubic feet. That's actually the largest chest freezer on our list. If you're looking for a larger size freezer, look no further than a GE chest freezer. The extra wire baskets really add to the overall capacity of the chest freezer by giving a place for smaller items like ice cream cones and frozen hot dogs to sit. The GE manufacture's warranty lasts for 90 days and covers most factory defects. Be sure you're purchasing from an authorized retailer and that you save the receipt, because you'll need it to receive warranty services. You may be offered additional product protection at the point of purchase depending on the merchant. Places that offer this kind of protection are Walmart and Sears. This chest freezer is a little smaller than the GE chest freezer; it only has 7 cubic feet of space inside. This product has some similar features to the GE chest freezer like a manual-controlled thermostat and storage shelving. A wire basket rests inside, giving space for smaller items while also keeping them separate from the larger ones. This design feature helps to keep your foods organized and easy to get to when you need it. This chest freezer comes in white and is cased in stainless steel and painted white for a nice clean look. Midea chest freezers are definitely more affordable than the GE chest freezer. The price is roughly $ before taxes, shipping, or product protection fees. This chest freezer is the cheapest one on our list. The features that come with this chest freezer are standard. There's an adjustable thermostat on the outside of the chest freezer that allows you to control how cold or frozen your food needs to be. This product comes with a hinged lid that stops at 75 degrees, giving you access to the freezer without having to hold the lid up yourself. A Midea chest freezer does not come with an interior light, making it hard to see inside when the lighting is not so great. The smaller size allows it to have more locations to store it around the house. The full dimensions of this chest freezer are 33.46 x 37.2 x 20.59 inches. The interior capacity is about 7 cubic feet in total, giving enough room for some larger items. Weighing only about 78 pounds, this is a medium-sized chest freezer which helps save space in the kitchen or garage. This Media WHS-258C1 chest freezer has two different warranties it comes with. The first warranty covers factory defects for the entire chest freezer for up to one year. A 2-year warranty is offered for the compressor to cover it for any defect it may experience. The average price of this chest is about $$ before fees like sales taxes and shipping. You can find it retailers like Amazon, Walmart, and Houzz. Prices vary from retailer to retailer, so shop around first before you make your final decision to purchase. This 5.5 cubic feet chest freezer is perfect for smaller spaces like those found in apartments and townhomes. The Danby chest freezer and lid are both insulated with foam to keep the heat out and the frozen items cold. Since it's a smaller size freezer, it comes with a single wire rack basket and a divider to give you some organization inside the freezer itself. This product is lightweight, weighing in at 68 pounds, and it is free standing. If you're looking for a larger capacity chest freezer, the 5 cubic feet may not be enough to do the job. When you consider the organizational options, however, you realize that the simple wire basket and the single divider organizes the freezer space in a way that gives it room for larger frozen goods. This warranty covers plastic parts that are defective for up to 90 days from the purchase date. All other parts of the chest freezer are covered on the warranty for up to 18 months from the purchase date. Last on our list is a chest freezer that is priced about the same as the GE chest freezer. It's small in size, so it's made for smaller kitchens and other smaller spaces. This chest freezer is about 5 cubic feet inside with a single wire basket, giving you as much room as you need for your biggest frozen items like pizza. The Haier chest freezer also has an thermostat adjustment knob and manual defrost. It also has durable hinges on the lid so that you can lift it completely up and not damage the freezer or yourself while reaching in and out. This 5 cubic feet chest freezer is great for smaller spaces like dorms and single-car garages. It comes with a manual defrost option and an easy-to-use defrost drain. The product also has a standard thermostat control. Free-standing hinges hold the lip up at a 90-degree angle, allowing you safe access in and out of your chest freezer. It's made out of all-white heavy-duty plastic that will help keep the temperature low. It can hold up to 175 pounds worth of food within its interior. The Haier chest freezer also comes with a single wire basket for smaller items. This allows for more space for larger frozen items to be stored like pizza or larger frozen poultry. The open space also gives room for things like ice cream cakes during birthday parties. The cake can be easily placed inside without being squished in with all the other food. A 1-year limited warranty for parts and technician labor covers this chest freezer. Other retailers like Walmart offer an extra product protection for a small fee that might come in handy in the future. Be sure to save your proof of purchase or the warranty is void. After reading the list, we can determine that the GE chest freezer is the best available. That could change, however, depending on what your specific needs are and the space you have available to work with. When it comes to smaller chest freezers, you have the option of the Haier and the Danby chest freezers. Of the two, the Danby 5.5 cubic feet chest freezer seems to be of much better quality and overall functional space. If you are interested in something that's medium sized, then the Danby chest freezer is for you. The best chest freezer of them all is the GE chest freezer with its large capacity and additional baskets. It comes with all the standard features of its competitors but with a much better defrost drain. We give the GE chest freezer 4 out of 5 Stars. Check your local merchants and bring home your GE chest freezer today! This GE chest freezers are incorporated with interior lighting so you can see inside when you need to. Furthermore, GE chest freezer comes in 10.6 cubic feet in size, which is a lot of storage. Handles on this product are recessed on the freezer lid. When it’s time to defrost this GE chest freezer, there is a usable manual mode to begin the process and a drain on the front to let the excess liquid to flow out. Moreover, inside this freezer are three separate baskets that can lift out to make more room if the need arises. This gives the buyer plenty of organization and keeps their small items from getting all mixed up. Beneath the three wire baskets is a wide open space to place your bigger items that you’d like frozen. It also comes with an adjustable thermostat, so you keep your food at the right temperature. However, GE chest freezers tend to have high price ranges due to components and materials used. Overall, GE chest freezers are one of the prominent brands of chest freezers in the market as of the moment.